Travelling sets me free, and I cannot go for more than a couple of months without heading out somewhere or the other. So when we, me and my husband (click here to read his blog about this trip), received an invitation to visit the Four Seasons' Vineyard near Pune, we had to say yes for several reasons -- a vineyard sounded exotic, we had never visited Pune before, Four Seasons in one of our favorite brands of wine, and of course this was an opportunity to travel, and it had been some weeks since we had last headed out. And before we knew it, we found ourselves there. Wednesday, 19 February 2014 The evening was cool and breezy. We stood gazing at the sun setting behind the hills, basking in the lavish hospitality being showered upon us. The aroma of the sumptuous kababs on the barbeque grill made the evening perfect. And the impeccably paired up wines added that extra zing. The open terrace of the Four Seasons' Vineyard was aesthetically decorated with lights and resonating with the ethereal harmonies emanating from the tabla and the sitar as the expert fingers of the accomplished musicians engrossed in creating music. We were perfectly at home by now. It was difficult to believe that we had arrived just a few hours back. In the morning, we had been flown on an early-morning IndiGo flight from Delhi to Pune. And the organizers had been thoughtful enough to book our meals on the flight as well. 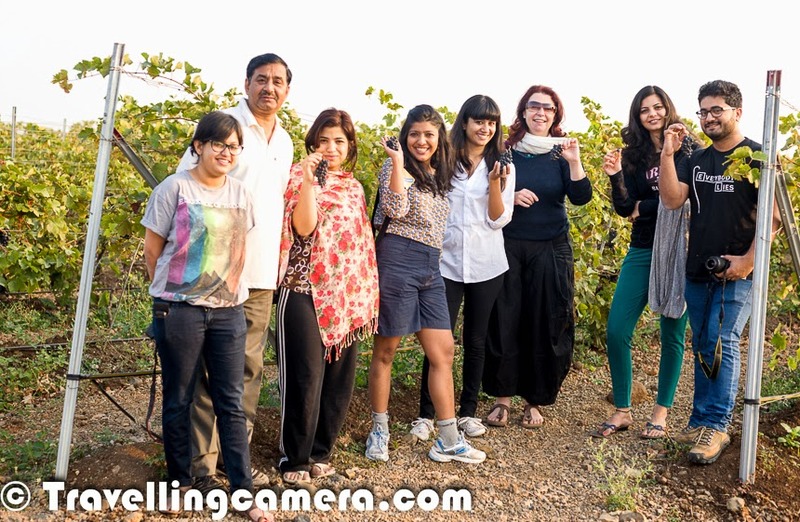 The drive from Pune to Baramati was scenic and had given us the opportunity to get to know some of the fellow bloggers who were participating in the event. 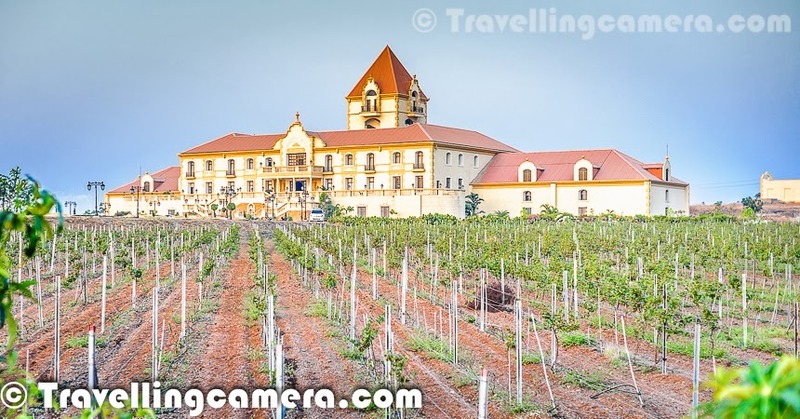 We had been driving for around 2 hours when the palatial building of the Four Seasons' Vineyard had first appeared at the horizon. The lone building standing amid the soft rolling hills had seemed more an illusion than a reality. We were famished by the time we had arrived at the Vineyard, and headed for lunch right after checking in into our rooms. 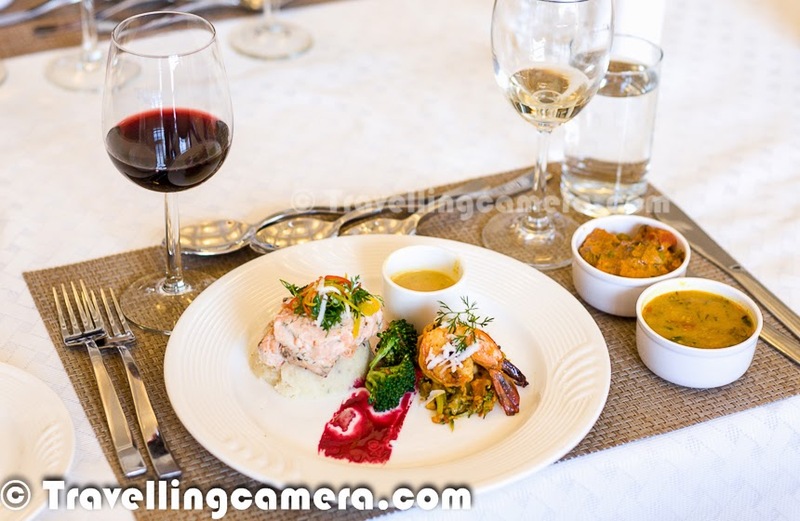 The lunch was a delectable affair put together by the award-winning Chef Hitesh Gautam. He served a four course meal -- we started with an amuse bouche, then proceeded to the starter, the main course, and then finally the dessert. The cuisine the chef presented combined Indian and Continental ingredients attractively plated, and each course was paired up with a different wine. Not only was it a lovely meal, it was also an amazing opportunity to learn about which wine goes with what types of flavours. While we ate, Mr Bala, the MD of the Vineyard, explained each wine to us and why it had been paired up with a particular course. Dry wine was paired up with spicy main course, whereas a sweet dessert wine had been paired up with the dessert. We tasted 4-5 wines during lunch. Grape Harvesting - Grapes of a particular variety are harvested and then brought to the facility for crushing. Crushing or pressing - Before the grapes can be crushed or pressed, the leaves and stalks need to e separated. The leaves are removed manually, but to remove the stalks, grapes are passed through a machine. This machine shakes the grapes to separate the stalks and then discards the stalks. It is important that this step be done carefully because if stalks make it to the crusher or the Pneumatic press, the resultant grape juice may end up bitter. After all the stalks have been removed, the grapes are crushed and passed through a press. The press gently squeezes the juice from the grapes. Fermentation - After crushing, the grape juice is transferred to huge steel tanks for fermentation, and this is where the juice turns into wine. 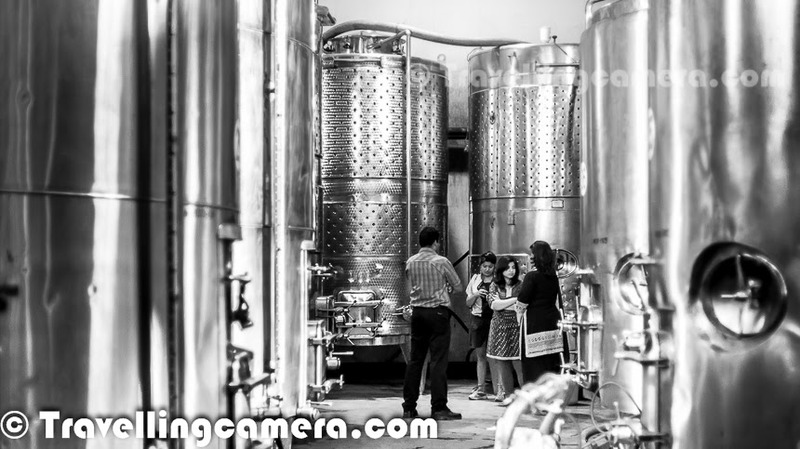 The tanks are all temperature controlled, and the ones that were being used in the vineyard were all made in India. 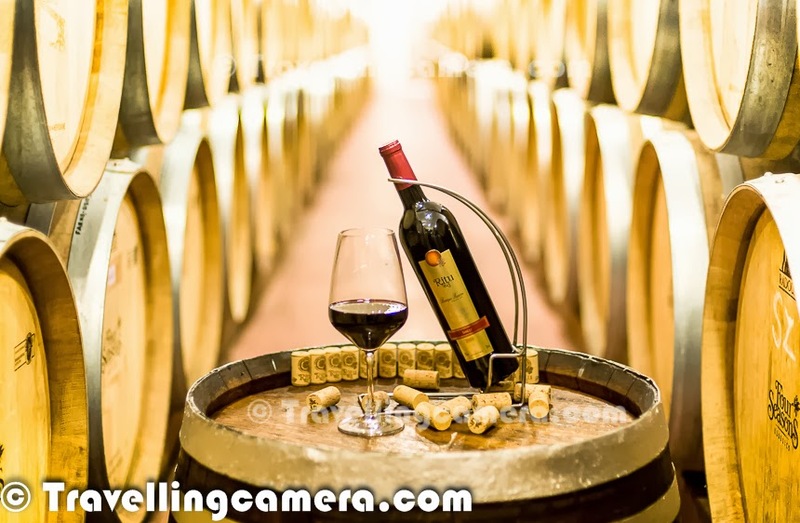 Stabilization and Filtering - After the fermentation, the wine is then left to stabilize and once that is done, it is filtered to remove any particulate residue. Maturation - Not all wines go through this process. While some wines do age well in bottles as well, some wines are kept in oak barrels for aging. How well a wine ages not only depends upon the wine, but also on the barrel. In fact, each barrel is unique and at times wines from some specific barrels turn out much better than the others. We tasted wines when we were in the fermentation room, and then in the barrel room. I specifically remember a very oaky wine which I loved. I am sure you can imagine our state after so many glasses of wine. By the end of the tour, my head was spinning, but there was still one more stage to witness -- bottling and packaging. This was very fascinating as almost the entire process was automated, and there were stringent quality checks on all stages. 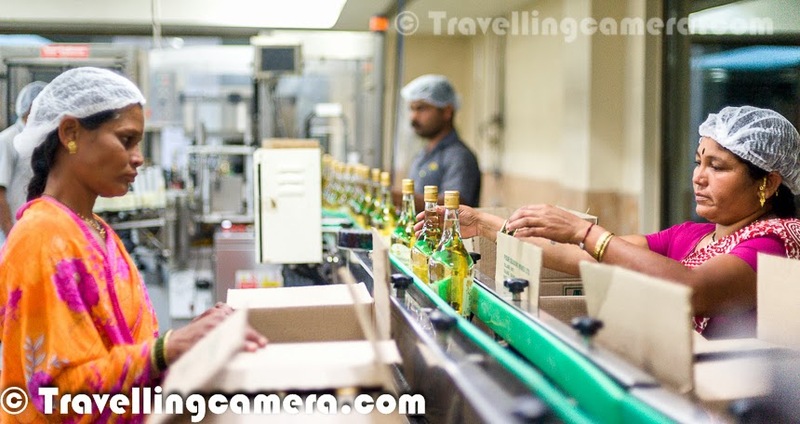 After bottling, each bottle was being manually checked for particles and after labeling, one person was checking all labels. Any label with slightest issue - such as air bubbles, overprinting, etc were being discarded. It was a mesmerizing experience to stand in the middle of the room with the bottles literally dancing all around us -- and not only because we had tasted so much wine. By the end of this tour through the winery we were exhausted and were dying for a siesta, so we retired to our rooms. And in the evening we found ourselves on the terrace among delicious kababs and melodious music. We were being pampered with great weather, lovely ambience, and of course more wine. And this is where I tasted my first-ever sparkling blush wine. Even though we had had a long day, none of us felt like retiring and sat talking late into the night. We also got a chance to get to know Chef Hitesh Gautam better. The topics of discussion ranged from social media to the job market to blogs to wines. And before long, it was 11 in the night and we knew we absolutely had to sleep if we wanted to wake up in time for the Vineyard visit next morning. Wednesday, 20 February 2014 We woke up at 7 am though we had planned to meet outside by 6:30. This was unfortunate because this meant that we would not be able to go for a walk outside the facility. I was disappointed because Mr Bala had told us that one can sight deer and even a family of Hyenas in the wilderness around the Vineyard. Unfortunately the sun was already out and the wildlife would have retreated to the shades. We still had the walking tour of the Vineyard to look forward to. Almost all varieties of grape -- Chardonnay, Chenin Blanc, Sauvignon Blanc, Viognier, Cabernet Sauvignon, Merlot, Shiraz, and Zinfandel -- grew here. Each variety of grape tastes slightly different. Some are more acidic than the others, while others have exotic aromas, and yet others have a unique texture. We walked around at leisure smelling and tasting different varieties. It was a relaxing experience for sure. Breakfast was the regular but tasty buffet, but lunch was once again special, with Mr Abhay Kewadkar, Chief Winemaker and Business Head of UB Group joining us. He gave us some valuable insights about wines and wine pairing. The lunch was once again an elaborate four-course affair. Chef Hitesh Gautam surprised us with each course. Not surprisingly, the lunch lasted for almost 2 hours. And before we realized, it was time to leave the facility. Mr Kewadkar presented each of us with a bottle of Shiraz, which is personally my favorite Four Seasons wine. After bidding good bye to everyone, we headed to our car, which was to take us to Pune from where we would catch our flights back. The event turned out to be one whirlwind of an affair. It seemed surreal while we were going through it, and now when it had come to an end, we wanted to go through it once again. 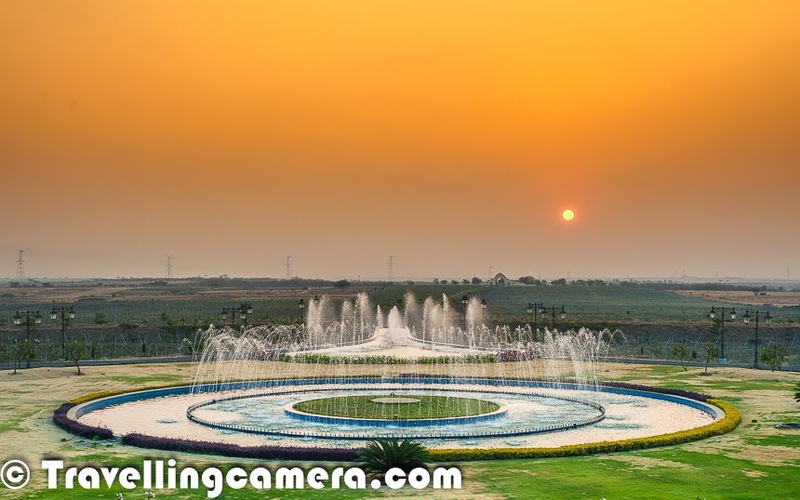 We were walking towards the gate of the Vineyard in the evening on 19th Feb, when all of a sudden the lights came on and the fountains started dancing. Frogs started croaking and jumping around. It felt as if the entire facility has come alive and started breathing. The biggest inspiration of the trip turned out to be Mr Kamruddin, the driver. He was the one who had picked us up from the airport and dropped us back. To find out how he awed us, you will need to read the next Meet the Street, which will be published soon.